Early in May, a few hundred people received hush-hush invitations to the Signature Theater in Midtown. They arrived for a staged reading, a spartan workshop production assembled in under 29 hours of rehearsal as a preview for potential backers and other interested parties. On a crowded stage, with scripts in hand, cast members played out a story set in an English town whose shipbuilding industry was in its last throes. The plot intertwines a love triangle, reckonings between fathers and sons and a labor uprising (workers seizing a factory to build a last ship before the factory shuts down) with crosscurrents of economics and faith. The songs bridge show tunes and British folk traditions. The presentation received a standing ovation, something that doesn't always happen at staged readings. The work in progress was "The Last Ship," a musical with its story and songs by Sting that is aiming to reach Broadway next year. 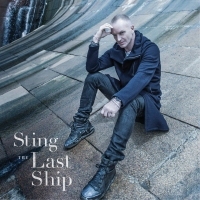 "The Last Ship" is also Sting's first batch of new songs to arrive after a long songwriter's block. Creating characters and learning the mandates of musical theater allowed Sting to step outside his usual songwriting self - only to realize, much later, that his own story was still being told. A few weeks after the reading Sting had returned to New York for a day of interviews at the offices of Interscope Records, between summer-tour concerts in Atlanta and Baltimore with his band. At 61, Sting (born Gordon Sumner) is trim enough to wear a tight T-shirt and jeans, and vigorous enough to juggle touring with the continuing rewrites of "The Last Ship," along with finishing an album, set for release on Sept. 24, of his own performances of songs he wrote for "The Last Ship." It includes some not in the musical; they sound comfortable as Sting songs, by turns folky and jazzy. On Sept. 25 Sting will perform them in a 10-night run of benefit concerts for the Public Theater at its 260-seat Anspacher Theater. The productivity, Sting said, is making him "blissfully happy." He was only "slightly uncomfortable" at first when he noticed, after finishing his 2003 album "Sacred Love," that he had stopped writing songs. The pensive, musically omnivorous, proudly erudite songwriter who, as the leader of the Police and over a long solo career, had made ceaseless surveillance sound romantic with "Every Breath You Take," who had mourned our shared mortality with "Fragile," and who had presented himself, only partly in jest, as the "King of Pain," no longer wanted to look inward. He had "lost my huge, burning desire to just put things on the page," Sting said. He was not eager for "the navel-gazing and confessionals and self-obsession that goes on with songwriters." "As you well know, it's required," he said with a rueful chuckle. "But at a certain point it's tiring. And then, of course, there's the public scrutiny of those revelations that you made, which is also tiring." Sting followed his instincts toward other projects. For three years he immersed himself in the music of John Dowland, the English Renaissance composer and lutenist whom he recognized as a fellow itinerant singer-songwriter. Then he traded the subtleties of the lute for a return to arenas with a 2007-8 reunion tour by the Police. "That was an exercise in nostalgia," he said. "The songs stood up - still stand up - but it didn't stimulate me to want to write new songs for a three-piece rock band at all. In fact, it made me crave a different kind of freedom." Another swerve followed the Police tour: "If On a Winter's Night...," a 2009 album of wintry seasonal songs, mostly traditional or adapted from classical composers, filled with thoughts of finality and death. Sting's songwriting drought had started to weigh on him. "I began to get a little concerned at that point," he recalled. "I said: ‘What are people going to say now? You're washed up.' "
In "Island of Souls," the song that starts "The Soul Cages," were seeds of a longer story: of a shipbuilding father and a son with wider horizons, in a town where "a working man works till the industry dies." Sting mentioned the idea of creating a musical about shipbuilders to a Broadway producer, who encouraged him to try it. And that, said Sting, "opened up the floodgates because I wasn't in the way anymore. "I was writing songs for other characters than me, other sensibilities than mine, a different viewpoint," he continued. "And so all of that pent-up stuff, all of those crafts I'd developed as a songwriter, I was suddenly free to explore without much thinking, actually. It just kind of came out as a kind of Tourette's, a kind of projectile vomiting. It just came out, very quickly." Only after the project took shape did Sting notice its autobiographical parallels. Its lead character wants more than the factory life and leaves to travel the world, as Sting has done. "I called this character Gideon," he said. "It had a biblical resonance, angelic. Of course, it's very close to my real name, Gordon. Somebody pointed that out to me, and I'd done that completely subconsciously. "So there are elements of me and the ambivalence I have toward my upbringing, where I come from, and then the exile and then having to come back and deal with the ghosts of the past," he said. "It's something I resonate with." Sting was no stranger to musical theater. "If you scratch me I'm a bit of a show-tune queen," he said. "I know ‘Carousel,' ‘South Pacific' and ‘West Side Story' by heart. I wore out those albums." Some of his earliest jobs as a musician were in pit bands in Newcastle, and in 1989 he played Macheath in a Broadway production of "The Threepenny Opera." There's more than a little Broadway in Sting songs like "Englishman in New York" and "Moon Over Bourbon Street." Yet Sting also realized that except for jukebox musicals presold by familiar hits, "the history of pop singers going into this field is littered with corpses," he said. Sting, who had been a self-guided solo act for 30 years, teamed up with Tony Award winners - the book writers Brian Yorkey ("Next to Normal") and John Logan ("Red") and the director Joe Mantello ("Take Me Out," "Assassins") - who showed him how musicals work and felt free to tell him no. "Every line fights for its life," he said. "Every couplet, every verse, every song, every character is constantly fighting for its life, even now." He added: "I'd write a song which I thought was fantastic - a Grammy-winning song! - and they'd say: ‘No, that's not in the play. It's not advancing the narrative. It's just expressing an emotion, and the narrative is static for three, four minutes. You can't afford that length of time.' "
"There's lots of strictures to satisfy," Sting continued. "It's a three-dimensional, multidimensional puzzle. I enjoy a good puzzle." Sting freely admitted to emulating Rodgers and Hammerstein - particularly Rodgers's yearning, augmented chords - in "The Last Ship." But the songs are also grounded in the traditions of his hometown; many are jigs and waltzes. The Newcastle area was once the medieval kingdom of Northumbria, and the region has stubbornly held on to its identity, its folk songs and its sometimes impenetrable dialect: Geordie. Kathryn Tickell, a traditional musician whose Northumbrian pipes open "The Soul Cages," rejoined Sting to work on "The Last Ship." "Some of the songs, I want to steal them and give them to a load of the folk singers around here," she said in a telephone interview. "I think a lot of them will be accepted into the tradition, and that's the biggest compliment you can get." Sting also coaxed out of retirement Jimmy Nail, a tall, rugged-faced actor and singer beloved in England for his long-running television role as a Geordie workingman; he will play Jackie, the factory foreman. "I served my time as a welder originally," Mr. Nail said by telephone. "When I stand there and sing those compositions I feel like those men are on my shoulder in the best possible way." "The Last Ship," Sting said, "gave me back my reason to write music." But beyond the next year earmarked for work on the musical, he has no plans to resume his old, introspective songwriting. "I don't think I need to go down there again," he said quietly. "I don't want to. I'd rather write about other people. I've mined myself."